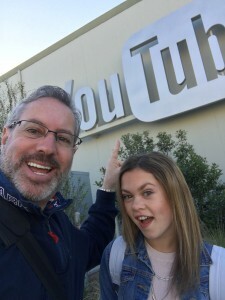 When some of our readers heard that my daughter Alexandra AKA Sparkles Lund was invited to attend Google Creator Day, they were genuinely interested in hearing about what she learned at this exciting event. She has written a blog post for her own blog, SparklesLund.com and I thought I would share it with you because there is some very interesting information about ways to build the size and engagement of a YouTube channel. Please follow her on Facebook, instagram, Twitter and subscribe to her YouTube channel, Enjoy! As you may know, I have been really publishing a lot of videos on YouTube the past year. It is something that became part of my career development strategy when I became a professional dancer. A lot of it was inspired by Will Willdabeast Adams, and his creative director, Brazil. When I started my channel, Willdabeast had about 500,000 subscribers. Today he has 1.5 million. When I started I had about 25, and recently I got the attention of YouTube when my subscribers neared 10K. First Observation – 10K is a magic number! Because I am in the entertainment industry, I personally know about 20 dancers that have more than 10K subscribers. Many, like Jordyn Jones have over 500K. Because their subscriber numbers are so launched, I really did not see my 10K as a big deal. However, I learned from YouTube that it is a big deal. It puts me in the top tier of YouTube creators in the world. 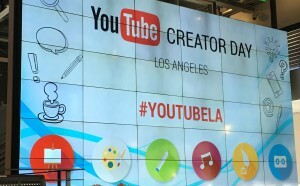 To encourage YouTube creators, YouTube has developed 8 film studios with legit equipment in major cities around the world including Los Angeles, London, Tokyo, New York, Sao Paulo, Berlin, Paris, and Mumbai. When you hit 10K, you can unlock the YouTube space and use their film studios for FREE! 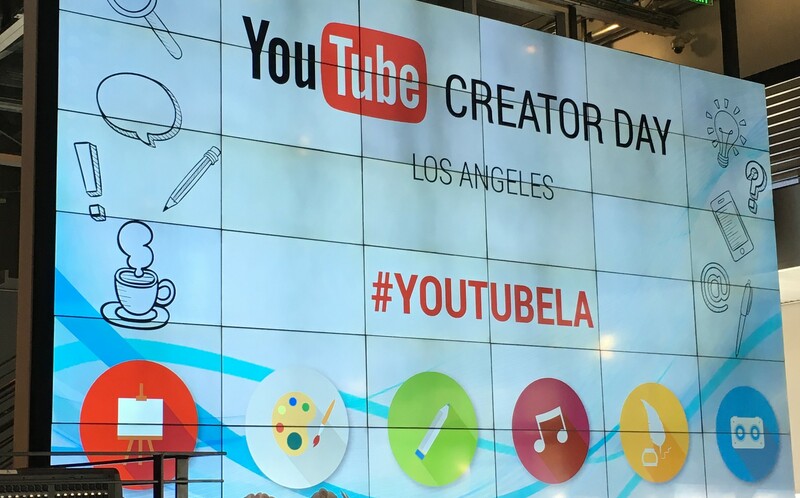 At YouTube Creator day, I was joined by about 70 other YouTubers to learn about best practices, discuss collaborations with other creators, tour the studio, and layout content plans. 2. Accessible – can every episode be fully appreciated by a new viewer? 3. Shareable – will viewers want to share these videos? 4. Collaborative – Is the channel working with other talents? 5. Targeted – is the channel targeting a specific audience? 6. Conversational – Is there an element of speaking directly to the audience? 7. Interactive – is there a way to involve the audience? 8. Consistent – are there strong recurring elements? 9. Sustainable – If the fans love it, can you make more of it? 10. Inspiration – Is the content coming from a genuine place of passion? If you are a YouTuber, or a video creator of any kind – consider your video content against these 10 content fundamentals. What is the Persona of your channel viewers? For me, I started publishing my dance to YouTube primarily to market my skills to choreographers who I was likely to see at an audition. Video has also become a popular way of submitting for dance jobs. I direct book some of my work with choreographers who know me, or select me from my video. I am pretty sure that it was a combination of knowing the choreographer and my video submission that helped me book the Justin Bieber Purpose tour. As my audience grew, I began to realize that my target was being reached by my videos, but the true personas of my viewers are kids like me; mostly other dancers. 81% are female and 19% are male. One think I try to do is answer every comment on all of my videos. There, I see that most of the audience that comments are girls my age and dancers. YouTube suggests that channel owners manage their content creation into three categories. The first is called Hero Content. If you are a fan of my channel, you may know that I have been doing this once a quarter for about a year, sometimes more often. For me, Hero Content is when I work with a choreographer and a professional camera crew on a set location to build a concept video. If you look at my videos with the most views, those are the Hero pieces. The second type of content is Hub content. For me, these are videos that were either from conventions or stuff shot in my studio. It is published once a week and typically on Thursday if I am not too busy. The third type of content is Help Content. This content is aimed at inspiring your page viewers, answering questions and stuff like that. I have a series of dance training videos on stretching, some Q&A videos and stuff like that. These are also known as special video that occur every once in a while on your channel. 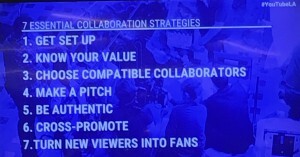 One of lessons from Creator Day is to Collaborate with other YouTubers. By working with other channel owners with similar or different fans, I can build my channel viewers and subscribers. I had the opportunity to meet a bunch of musicians and we know that they always need dancers. I have also done some collaboration with other dancers. They are super fun. If you have a channel and you want to collaborate – let me know!